"In times such as ours, and the times from which they spawned, ages of violence against all forms of 'other' — genders, bodies, skins, ideas — how can we lay to rest the ghosts that haunt us, and invite to the table those that help us live? Writing from the headlands far into the interior, threading the personal with the public, an elegy with a covert manifesto of hope, Colin Dayan understands what it is to be haunted: by history, by race, by family, by what presses on the definitions of one’s life. In pages at once strikingly evocative, allusive, and embodied, rigorously sensory in their hard-won wisdoms, Dayan argues for the co-existence of species, variants of identity and belonging, a commonwealth of the living and the dead. In the Belly of Her Ghost imbues profound remembering with a democracy of looking and listening, where all that matters — objects, animals, people and place — is properly attended. It is a volume appearing undeniably in its necessary moment, and it is precisely necessary because the truths it speaks are as old as our troubles, as required as our joys. "This subtle, ambivalent, deeply thoughtful book makes nothing easy — difficult moments are imbued with grace and familiar parades of ghosts. We hear a series of conversations: with the past, with selves old and new, with memories of Haiti and the American South, with a black woman who effectively mothered the writer, with an actual mother both dead and alive. How many of us could so lucidly say of a disappointed and disappointing parent, 'I did not want to love her as much as I did'? At the center of this haunting narrative is an unforgettable ghost story, which, ultimately, is not quite a ghost story at all." "I sat rapt, coiled tensely around myself, awaiting I didn’t know what exactly, nothing I could put a name to, but something I felt a fierce identification with, an anxious anticipation, a premonition of dread, a shroud of sorrow, a life encompassed by secrets. 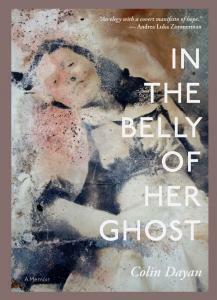 In The Belly of Her Ghost is a soul story that resonates in the body of anyone who has been or is cast out of anywhere she calls home. It’s allusive, elusive; its strength is its narrative freedom from story as we know it. Its brilliance in earth shimmers (I will never again think of a summer night in nature in any other way). Its time is archetypal, images, ideas, affects evanesce and return. For this country is timeless." "This is no ordinary family story: it is a lyrical telling of how racial terror and patriarchy reverberate in our most intimate relationships; it is about love aborted and love forged in violence and repression. As rejection, loss, and self-loathing simmer on the surface, this beautiful and desolate work recounts social harms and personal grievances. But it also bears witness to the persistent longing for connection that we carry with us and reminds us of what remains: an abiding faith that love can make you whole, even in death." "Colin Dayan has one of the most original minds in America and also one of the fiercest. Here for the first time she turns her rigorous intellect toward her own life, onto her vexed relationship with her mother and subsequent suffering — and she does so with her usual uncompromising clarity. It’s rare for such a tormented work to be so masterful."